On Day Six of 24 Days of a Baltic Christmas we welcome back Daiva Venckus! Daiva is the author of an upcoming book about her experience working for the leaders of the Lithuanian revolution during the collapse of the Soviet Union. For more on her experience please visit her website, and she can be found on twitter @DaivaVenckus and on facebook. Long before Christianity, Baltic tribes shaped their faith from the natural world. The simple cosmology of the circle of life, of death and rebirth formed the foundation of tradition and ritual. A pear stands in the middle of the field, Kaleda. Oh! And a spark fell, Kaleda. Oh! And the blue sea spilled over, Kaleda. On that sea – a ship is sailing, Kaleda. In that ship – a chair stands, Kaleda. On that chair – a girl sits, Kaleda. The “Deer Mother” who represented the “life-giving-mother-deity,” was a center figure in Winter solstice celebrations in ancient and primitive cultures. The Deer Mother flew across the earth on the longest, darkest day of the year carrying the sun within her antlers to usher in the return of the sun and resume the fertility of the land. 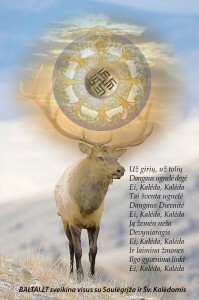 In Lithuania, the Devyniaragis, a white deer with nine antler points, carried celestial bodies, in particular, the sun and the moon within its antlers. The Deer Mother legends varied, as there are stories in both Lithuanian and Latvian cultures of the goddess Saule flying across the sky in a sleigh pulled by reindeer and throwing amber (a symbol of the sun) into the chimneys below. One can see how this pre-Christian belief has permeated into modern Christmas traditions celebrated today. 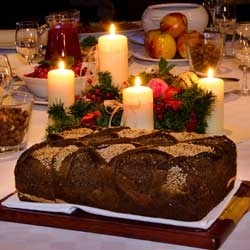 Lithuanian Christmas, or Kaleda, customs have retained many of the pre-Christian rituals and absorbed Christian meaning. Some are practiced in most Lithuanian households, and others, perhaps require living on a farm to be observed. Preparations for the Christmas celebration were a part of the ritual. Cleaning, bathing, and fasting to purify oneself for the sacred event was common. The house would be decorated with evergreens to recreate the “sacred grove” for the celebratory rituals. In the middle of winter while most vegetation are in a deep sleep, evergreen fir and pine trees continued to thrive and represented the sacred powers of life and fertility. Bringing in a small fir tree and decorating it was a German influence and became a custom after World War I.
Christmas Eve began with the Kucia bread, made of various grains, which represents regeneration. Once all guests had arrived, the male host of the house would take the Kucia bread and circle the farmstead three times, and then knock on the door. When asked, “Who’s there,” he’d reply, “Dearest God with the Kucia bread.” The bread then would be shared amongst the guests after blessings. It was unlucky for an odd number of people to gather at the table, so those who had no place to go were often invited. The more common version of this custom practiced today is the sharing of the Christmas communion wafer with the added tradition of trying to remain with the largest piece since it meant you’d have a lucky year. --The entire family must eat the Kucia meal together to ensure the animals do not scatter. --The fruit trees were wrapped in straw to increase their productions. --Sprinkling wheat and peas in the barn will ensure good animals. --After the dinner all the milk pots are taken outside and placed all over the farmstead so the cows would give more milk in the next year. --If you want your horses to be good looking, steal manure from your neighbor and feed it to your horses. --To keep wolves from carrying away animals, mention wolves while eating. The Christmas Eve table was covered with a white linen tablecloth and hay underneath it. 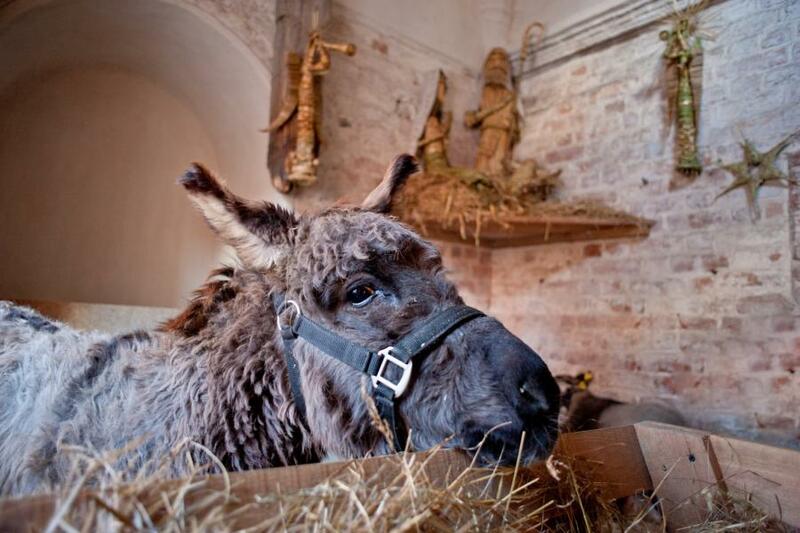 After Christianity was introduced, the hay represented the hay in the manger of Jesus’ birth. However, the hay provided fodder for predictions. After the dinner everyone pulls a hay straw from under the tablecloth. The length of the straw indicates how long one will live. For the younger unmarried individuals, the length of the straw indicates how soon, or how long they’ll have to wait to marry. Those who pulled the fatest straws were predicted to grow fat with prosperity and wealth. I’m sure everyone is well aware that twelve meatless, non-dairy dishes are prepared for the meal. After the introduction of Christianity, these twelve dishes represented the twelve apostles. In pre-Christian times they represented the twelve months of the solar calendar, indicating the position of the Earth on its revolution around the sun. But originally, thirteen dishes were prepared to represent the lunar calendar, as the moon rotates around the Earth every twenty-eight days. One must eat from every dish, or else, the superstition states they might not live to see the next Christmas. Leaving the table before everyone has eaten was also considered unlucky. A candle is often lit if someone died in the past year to invite them to the celebration. The fire invokes the eternal sacred fire, representing the unbroken lifeline of the family and ancestors. An empty plate remains on the table for those who are no longer with us. Food also must be left on the table overnight for the ancestors to feast and to bring them peace. Sometimes a cup of kvass would also be left for them. While the ancient tradition of winter solstice represented the regeneration of life, it's no surprise that wedding predictions have become a main focus of forecasts and superstitions during Christmas. --A young girl could learn the name of her future husband by writing every name she can think of on separate slips of paper and placing them in her pillowcase. On Christmas morning she can draw a name to discover the name of her future spouse. --A girl of marriageable age would go out and return with wood for the fire. If she brought back an even number, then she’d be married that year. --The windows are covered. A rooster’s and a hen’s tails are tied together. If the rooster pulls the hen to the door, there’ll be a wedding, if the hen pulls the rooster, there will be no wedding. --A ring is dropped into a glass of water. The number of ripples shows the number of years before her wedding. Christmas Eve was considered a magical time. At midnight, animals gained the ability to speak like humans and, having additional psychic ability, were rumored to talk about when their masters will die. However, it was dangerous to venture to the barn to find out what they were talking about because of the topic of their conversation, which is something no person should know. On Christmas morning the dinner table is cleared away, but first, everyone checks to see if there is any evidence that the souls of their ancestors visited them and enjoyed the feast while everyone slept. The hay is removed from the table and given to the animals in the barn, to recognize the animals present in the manger where Jesus was born. If the hay leaves most of its grain and seeds on the table, then it meant they’ll have a bountiful harvest the following year. The weather during Christmas also provided predictions. A clear Christmas Eve night would predict a good year for all. If snow had fallen Christmas morning and covered the ground, then Easter was going to be green. If snow hadn’t fallen, then expect snow on Easter Day instead. Although Christmas celebrates the birth of Christ, the symbols of the cycle of life, and the return of the sun form the foundation and continue to permeate the Lithuanian Christmas rituals practiced today. Thank you Daiva! 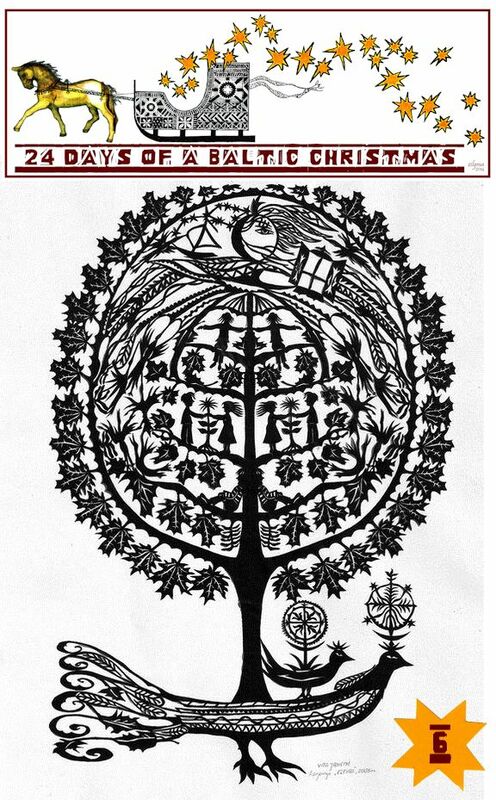 It is fascinating to compare the Lithuanian and Latvian holiday fortune-telling customs, and I'm not at all surprised how similar some of them are... Daiva helped make the 1st 24 Days of a Baltic Christmas a success, and I urge you to visit her 2014 post, Kucios: The Connection Between the Dead and Living. Please join us again tomorrow for more Baltic Christmas inspiration in the form of a gift guide! How interesting to note that many pre-Christian winter solstice customs and beliefs were adopted into the Christian Christmas celebration! And - many of us keep some of the traditions as a connection to our pre-Christian roots, as well as enjoying the modern meaning of Christmas. Most interesting to read. My mother told me about putting hay under the white tablecloth, but never elaborated. Now I wish, so much, I could ask more about her family's celebration traditions. Thank you for today's read.